Sleek clean lines and simply styling allows this bed to go with most decor. It's lower headboard height means this bed is ideal for smaller spaces. Headboard, footboard and rails made of faux white leather. Built in platform with 26 bent wood slats means a box spring is not required. Also available in other sizes. 39"H x 65"W x 84"D, 80 lb. 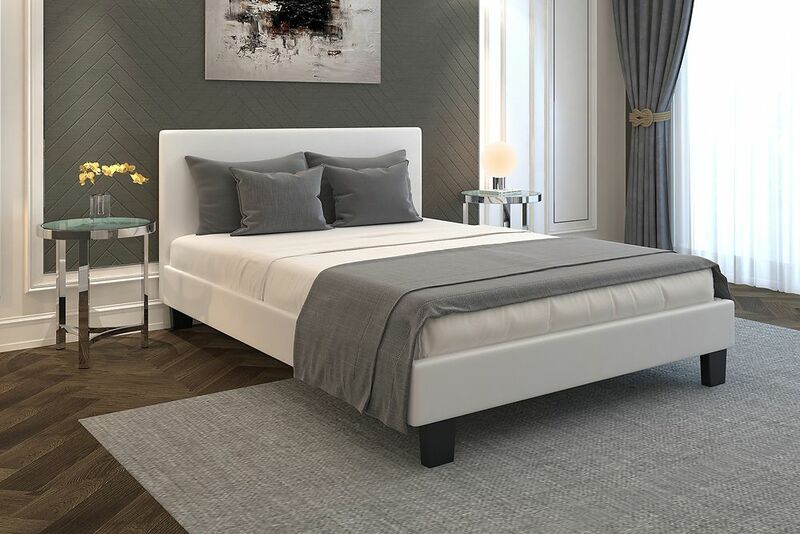 Volt Queen Platform Bed - White Sleek clean lines and simply styling allows this bed to go with most decor. It's lower headboard height means this bed is ideal for smaller spaces. Headboard, footboard and rails made of faux white leather. Built in platform with 26 bent wood slats means a box spring is not required. Also available in other sizes. Volt Queen Platform Bed - White is rated 4.4 out of 5 by 7. Rated 3 out of 5 by mamamiaohya from Okay bed for the price, but look out for defects! I ordered this online based on very high reviews. I was looking for a white platform bed -it is not exactly white, yet the bed is more ivory-not a bright white. But it will do. The issue I had was that it was delivered with a hole punctured right through the box and into the headboard. Customer service at Home depot online was TERRIBLE. I was on the phone for 2 hours trying to set up an exchange. Finally, I decided it was best to take it into the store myself and return. I did this while ordering another one online the same day. Okay, that was done on my own time. Putting it together does require 2 people, not very complicated. Keep in mind that if you are not using it with a boxspring, there will be gaps in the corners of your mattress (unless your mattress is completely the same shape. Although, I do not recommend a boxspring as it will be quite high and cover the headboard. I did order the matching rBella 18-inch x 17-inch x 36-inch Faux Leather Ottoman in White. Delivery was as quick as the bed (2 days), but lo and behold, DAMAGED PRODUCT ! It had 2 long tears in it. I was utterly disappointed as they do match well and look great together. Again, back to Home depot to return and reordered a new one. Overall, products look okay for the price, but the manufacturer needs to make sure they ship off an intact product and customer service online needs to focus on CUSTOMER SERVICE. The store was quite good at dealing with the matter. The online reps needs more training. Rated 4 out of 5 by Carole from Platform Bed - White I ordered this bed online. It is beautiful. My only complain is that the bed is not really white. It's off white and this should be mentioned. I put it together myself and it was very easy. Rated 5 out of 5 by Wally from Top Notch Value! Purchase for spare room. Solid. Easy to Assemble. Looks Great. Rated 4 out of 5 by Sepi from Volt Queen Bed Frame Great bed frame. Good quality easy to assembly. Can be used with or without a box spring. Has solid wooden slats for no boxspring if you prefer a low profile style bed. Color is more cream then white but nice. Solid no squeaks. Leather is soft and a fair quality. I'm happy with the product. Rated 5 out of 5 by Lizy from Great quality I am really very happy with my purchase. This bed frame looks beautiful and very stable. Easy to assemble. Perfect choice for the small bed room.